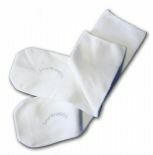 Absolutely no seams whatsoever - these life saving socks can make a real difference to sensitive, sensory and disabled children. These ones often work with highly sensitive kids when all else has failed! Available in Black, White, Charcoal Grey, Pink, Purple and Peach (orange).